Phil Mickelson during the second round of the 2019 Desert Classic at PGA West. Another day on the PGA Tour, and another near-violation of the new drop rule. This time, though, the culprit is none other than five-time major champion and Desert Classic tournament leader Phil Mickelson. Mickelson got off to a red-hot start on Thursday, firing a 12-under 60 for the best round of his career in relation to par. That epic opening salvo was good enough to give Phil a three-shot lead in his first event of the year. On Friday, he began the second round much as he had finished the first, making early birdies at holes 11 and 12 after starting the day on No. 10 at PGA West's Nicklaus Tournament Course. But a double bogey at the par-4 18th erased those early successes. He eventually finished strong to shoot a four-under 68 and maintain his lead. At some point along the way, Mickelson was forced to make a drop, and cameras were there to catch the moment. As you no doubt have heard by now, a change to the drop rule was enacted on January 1st along with a host of other rule changes. 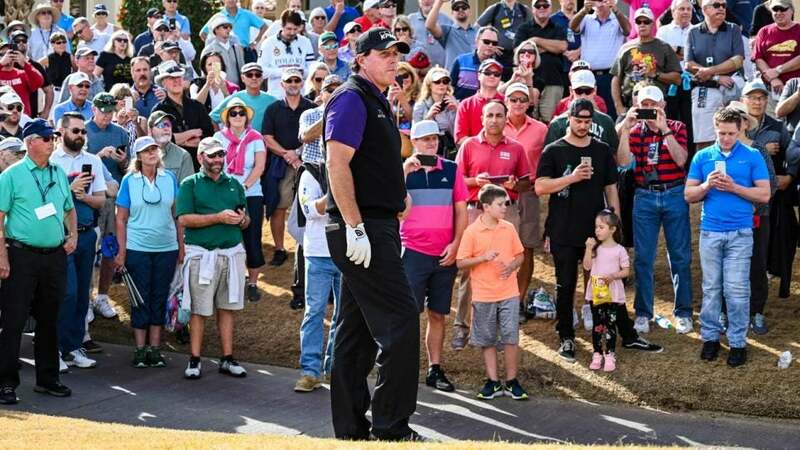 In a since-deleted video on the PGA Tour's Twitter feed, Phil began to make his drop the old way, from shoulder height, either out of ignorance of the change or, more likely, out of sheer habit. But a rules official was standing right next to Phil and stopped Lefty before he was able to make the incorrect drop. Phil acknowledged his mistake, and then bent over farther to make the drop from knee height, as the new rule requires. https://twitter.com/GOLF_com/status/1086345323830755330 Several Tour pros have made a similar mistake early this year as they all adjust to the new rules. Mickelson isn't even the only major champion to have issues. Jordan Spieth nearly violated the drop rule at last week's Sony Open, one day after criticizing the change in his pre-tournament press conference. Henrik Stenson did the same just two days ago playing in the European Tour's first event of the new year, the Abu Dhabi HSBC Championship. The silver lining to all these incidents is that violations were avoided in each case. That's not just due to timely intervention by rules officials, but also because leniency is appropriately written into the rules. Even if a player drops from the wrong height, under the new rules they are allowed to re-drop before hitting their shot without penalty.